James lost his two front lower teeth due to an accident. He saved and went to a dentist for a partial denture. Unfortunately this partial denture was unsatisfactory and broke after three weeks of having it. James made himself a denture out of electrical solder which he glued in on a daily basis. James has recently started his own handyman company, building decks and fences. Because of this, finances were stretched, and James became very self-conscious of his DIY teeth. James saw a post on Facebook about The Chris Pine Foundation and decided to apply. Chris reflects on James’ journey below. “When I first met James, I was very impressed with his electrical solder plate, he actually did a really good job making it. Starting your own business takes courage and I applaud James for taking that risk. I have been in James’ position before, all your spare money goes into the business with only enough leftover each week for the essentials. I was so happy to be able to help James. Upon examination, James was missing his two front lower teeth. All his other teeth also needed attention. I phoned my friend, Dr Jane Wallace at Orewa Dental to discuss James’ case with her. She said it would “be her honour” to help James and be involved with The Chris Pine Foundation. Jane completed a couple fillings and gave his teeth a good clean. She also put James on an on-going maintenance plan at Orewa Dental to ensure his teeth are well looked after. 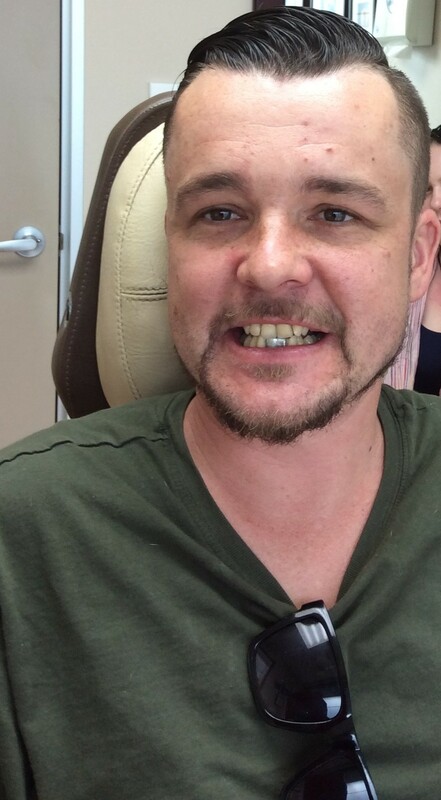 Hauraki Smiles, a Dental Laboratory, also kindly sponsored the metal frame work for James’ new partial denture. This was an incredibly kind donation and I was so grateful to Diane for this. 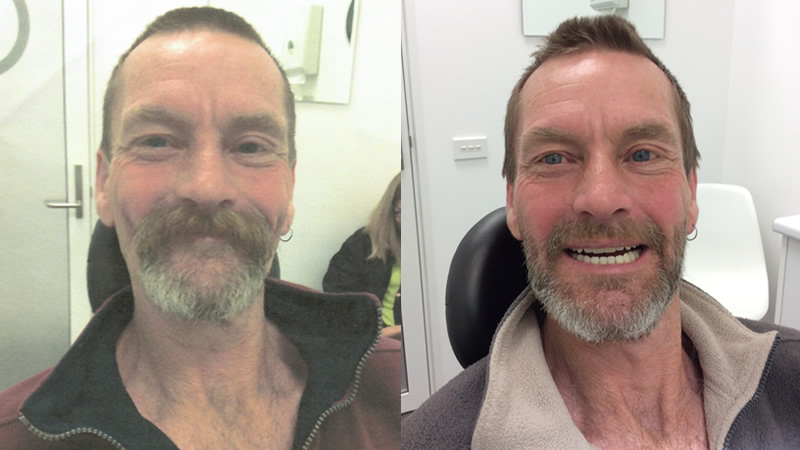 I fitted James’ new lower partial metal denture in November. It looked really great and fitted well. The new partial plate is absolutely fantastic, fits so well, and I am so happy to not have to glue my homemade ones in every day! I couldn't be happier and wish there was more I could do to show my appreciation. My experience with you guys could not have been better. Everyone there was very professional, supportive, helpful, and friendly. It made the whole experience great. Up until I was accepted for help from you guys, I had always worried and stressed how long I would be stuck with my homemade teeth until i could afford to have something done again. I was embarrassed by my teeth, (or lack of haha) especially if they came out while in public etc. Again I would like to thank Chris, Dr Wallace, and everyone else who was involved in some way with my case, and I hope I have the opportunity to pay it forward in some way soon. “Lynn had her remaining top teeth extracted and was unable to afford a new denture as she was still paying off her previous set. Because of this, she was unable to eat a lot of different foods, she was embarrassed to talk and smile. Lynn was desperate to start feeling better about herself, so she applied to The Chris Pine Foundation via a post she saw on her local ‘pay it forward’ Facebook page. 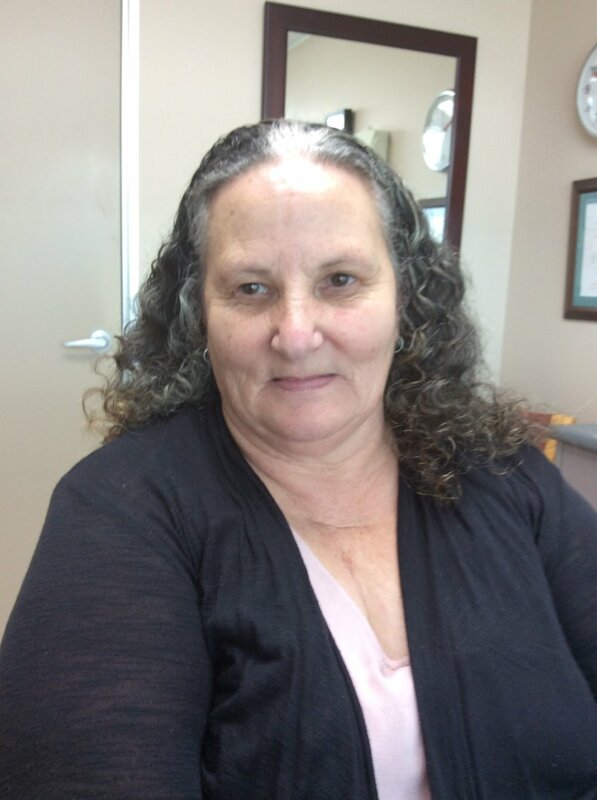 “Lynn hadn’t worn an upper denture for some time due to it no longer fitting because of extractions. She had 6 remaining lower teeth that were in good condition. I could tell by Lynn’s personality that she is a very bubbly and outgoing person, but held back by lack of teeth. We got started on a new full upper denture and lower plastic partial. We used Ivoclar Vivadent’s teeth in shade 1C. This gave Lynn a nice and bright smile. My very good friend, Dr Mila Milic from Hobsonville Dental sponsored her time for Lynn’s Oral Health Certificate check. Mila’s practice is 10 metres down the corridor from our Hobsonville practice. Mila has been involved with The Chris Pine Foundation for many years now and I am so very grateful for her on-going support. During the fabrication of Lynn’s dentures, I witnessed her coming out of her shell more and more. I also learnt that Lynn is someone who ‘pays it forward’ as much as possible. She is heavily involved in her local ‘pay it forward’ Facebook page and often helps others in the community when she can. She even knitted beautiful wool jumpers for my grandsons. Lynn bounced out of our clinic with her head held high and a huge smile on her face. I was so honoured to have met Lynn and help her with new dentures. I know she will continue to pay it forward when she can. I had tried many times to get new dentures made, but just couldn’t afford it. One day I was scrolling through Facebook and saw the post about The Chris Pine Foundation. I thought I would apply, because I was desperate. When I got the news I had received the grant I was shocked, as I never win anything. It took a few appointments to make my new dentures, but I had the reassurance from Chris the whole time that he wanted everything to be perfect. Chris and his team made me feel really cared for, as if I was paying for my new teeth. I would like to also thank Dr Milic for her time checking my teeth. The fact that people can be so generous and do this for me has been unbelievable. For the first time in 18 years, I smile and I wear lippy! My grandchildren love my new teeth and mention them every time I see them. I feel like I am a different person. I look forward to going to job interviews, not only because of my new smile but of the fact I am a happier person within myself. I have so much more confidence and I want to shout from the rooftops how happy I am. To all the sponsors involved, thank you so much. If there is anything I can do to repay this amazing thing, I will. Martin wore very old full upper and lower dentures for over 20 years. The teeth were worn, and his bite was over-closing. Martin has suffered with ‘cluster headaches’ since he was 19 which cause extreme pain, blood noses and more recently seizures. Because of this, Martin had to stop work. His health and appearance was a constant worry for Martin. Martin applied to The Chris Pine Foundation as a last resort for help with his dentures. He was over having dentures that didn’t fit well and caused him to become self-conscious of his appearance. Martin, his wife Anita and their two children, Daniel (11) and Abigail (7) (who both took the day off school) came to Martin’s initial consultation with me. As a family man myself, this really meant a lot to me to see Martin’s family so involved in the journey he was about to go on. Martin’s dentures were worn out and he was over closing, in a class iii bite. This was causing his mouth to be down-turned and made him look grumpy. We made new full upper and lower dentures for Martin. We used Ivoclar Phonares B82 in shade A3. This gave Martin a really natural look. The composition of the Phonares teeth will enable Martin to bite and chew his food with ease. We bought Martin’s bite back into a class ii and added some padding around the denture. The end result is excellent. I am really happy with the natural look of Martin’s new dentures and the fit is good too. At the final appointment, to which the whole family came again, you could see the pride on their faces. Anita, Daniel and Abigail were so proud of their Dad and his new smile and they were incredibly grateful to the foundation and the teams behind it who made it all happen for Martin. I look forward to my annual catch up with Martin and wish him the very best. Before my new dentures from Chris and the team I was so self conscious of my appearance. My dentures were uncomfortable and never fitted properly from day one – but I just got on with life. When I got sick and couldn’t work I would constantly worry about everything. From my health through to the financial implications on my family resulting from me not being able to work. I really wanted dentures that I could smile with and eat with. Chris and the team were fantastic. So friendly and very clever at what they do. My jaw used to jut out when I bit together, now it doesn’t which is so much better. It took me a while to recognise myself in the mirror, I really like my new teeth. To Chris, the DentureTech team, Ivoclar Vivadent and all the other sponsors to this wonderful foundation, from the bottom of my heart I cannot thank you enough. You have really changed my outlook on life and given me so much more confidence. Thank you! Anita came to DentureTech originally seeking a second opinion on a set of dentures, a full top denture and a partial plastic lower denture made for her by a dentist in early 2018. We noted that the bite was too open, the centreline was not straight, and the teeth were too prominent. Anita did not have the finances to be able to have another set of dentures made and was therefore looking at having to “live” with this set of dentures. When 2018 applications opened, the staff at DentureTech immediately thought of Anita and encouraged her to apply. “I first met Anita by consulting on a second opinion on the set of dentures made by a dentist. It’s a fair assessment to say that in my opinion this dentist was obviously inexperienced at making dentures. What was worse, I felt that Anita was being given a hard time, she appeared to be getting no where and she was not able to afford new dentures thus she applied to the Chris Pine Foundation for help. “ I was thrilled to be involved with Anita and we got started on a new full upper denture and lower plastic partial denture for her. We used Ivoclar Vivadent’s Phonares teeth S71 in shade C1 for Anita which gave her a nice bright smile, something she really wanted. We contacted a dental practice up north to help Anita with her remaining lower natural teeth, they do not want to be named, but I wish to thank them publicly for their help. Watching Anita relax and enjoy the denture making experience with us has been wonderful. She kept commenting on how professional and nice everyone is. The end result for Anita is excellent, the dentures look great and she is functioning really well with them. I was only wearing my top denture, the bottom partial denture did not fit at all. I went to a dentist who I felt was in-experienced, I had so many visits to him and it was still not right. He referred me to another dental technician whom also was unable to fix the problems. The dentist was very rude to me and unprofessional which caused me to be very distressed by the whole process. I couldn’t afford new dentures – I was really stuck. Working with Christina through the Chris Pine Foundation has been a great experience. She has gone the extra mile for me and worked extremely hard to make everything perfect. I just love me new dentures! My daughter Bex, has also commented on my new smile! “It has done heaps for Mum’s confidence. It’s like a huge weight has been lifted off her shoulders” says Bex. I would also like to thank the dentist I saw. He was very nice and will be seeing me regularly for on-going care of my remaining lower natural teeth. Thank you all so much! This has been the most fantastic thing. In 2017, 2 individuals were chosen from the North Shore and West Auckland to receive free dentures from The Chris Pine Foundation. 2017 was a rough year for Susan. As well as having her partner of 37 years leave, she had to leave the family home and move into rental property with her 2 adult special need sons and her elderly mother. Susan, being the kind and dedicated mother, she is, put the needs of her family first. Unfortunately, this meant that her teeth deteriorated beyond repair and with all spare money at the end of each pay cycle going to her family - she was making do without. Susan applied to The Chris Pine Foundation for new dentures. She wanted to start looking after herself again and build her confidence back up. As well as working full time, Susan is a long-standing volunteer with the Special Olympics and is often going above and beyond the call of duty to help the children to excel in sports. Susan had no teeth left in her upper jaws, and only 5 bottom teeth left in her lower jaws which called for extracting. The Chris Pine Foundation are extremely grateful to Dr Sam Goldsmith from North Shore Oral and Maxillofacial surgeons who donated his time and materials to look after Susan and extract her last remaining teeth. Full upper and lower dentures were made and fitted for Susan. The materials, including premium Phonares II teeth were kindly donated by Ivoclar Vivadent. Over the weeks working with Susan, we witnessed her confidence grow and she left with a huge smile on her face and great optimism at what the new year would bring. “I applied to The Chris Pine Foundation because I really wanted to look a lot better for myself. I lacked self-confidence and would always hide away from smiling. The complete process of getting my new dentures was easy. Chris Pine is cool, and he made me laugh which put me at ease. The reception ladies were really nice and were always happy to see me which helped so much as I was really nervous. DentureTech Albany is a wonderful place where all the staff are very happy and there is lots of laughing going on – I really liked that. I would like to thank everyone who helped make this possible. Dr Goldsmith who took out my awful, yucky teeth, he was awesome! I know that a big dental company called Ivoclar sponsored the materials to make my new dentures and I am so grateful. There were a lot of people behind the scenes that also made my new dentures possible, so I would like to thank EVERYONE! You have all made me much more confident and I can smile again! I feel so much happier about life and I am getting really nice comments from friends and family about my new smile. Three years ago, Keverne had all his teeth removed. He never wore a denture. His health deteriorated, and he had to leave his job to get well again. Once his health started to improve, he started seeking employment again, however he found it extremely difficult to find a job with no teeth. At 57 years old, Keverne wanted to work again, to contribute to society and support his family. His self confidence started to take a dive. He knew he had to get teeth, but just couldn’t afford it.So, he applied to The Chris Pine Foundation for dentures. Keverne really stood out because of the huge amount of voluntary work he does on the Waimauku marae. Keverne, is normally the guy in the background, quietly going about work never expecting compensation for his time or even a thank you. DentureTech Hobsonville’s practice manager, Christina Lole, talks about her first hand experience working with Keverne and the Chris Pine Foundation. “ The first time I met Keverne, he was very quiet and shy. He didn’t say much. It could be interpreted as being a bit ‘stand-offish’ but was probably more nerves. He lives on the marae with his wife and does so much for the community there. At each appointment, you could see him coming out of his shell more and more as his confidence grew. At the try in phase (where his new dentures are put in his mouth for the first time), his wife squealed and said, “she was falling in love with him all over again”. This was such a highlight for me to witness. By the end, Keverne would not stop talking. This made me smile, because I knew that this process didn’t change who Keverne was – it only bought back the old Keverne who had been quietened down for a while. This year we selected 2 recipients to receive free dentures from The Chris Pine Foundation. Peter applied to The Chris Pine Foundation upon the recommendation from his case worker at Work and Income New Zealand (WINZ). In his application Peter said he was currently unemployed but actively seeking full-time employment. He said “I believe having dentures will assist me because people judge my appearance” referring to his current edentulous situation. Peter required top and bottom dentures. Upon meeting Peter, he was very shy and overwhelmed at the enormity of receiving new dentures for free. As time went on, he became more relaxed and at home with Chris and DentureTech Hobsonville’s practice manager Shelley. The day finally came where Peter would walk out the door with a new smile. “ This whole process has been fantastic. From my greeting to the follow up it has been seamless. Everyone here has been so focused on helping me. It has been amazing. I have gotten so used to having no teeth, so I never thought much about how I look. I can’t wait to smile and eat properly. The feeling is priceless. I would like to thank all the sponsors of The Chris Pine Foundation very much. You all make a fine product. This is a real gift and I am very grateful” Peter. Simon successfully beat cancer in 2013 however due to the numerous rounds of chemotherapy he endured his upper teeth deteriorated beyond repair. They were removed in 2014 and since then Simon has not been able to afford to have a full top denture made. In his application Simon spoke about the implications having no teeth had on his life. From struggling to eat any solid food through to a rapid decline in his self confidence resulting in him being rarely seen in public. Simon is a very dedicated father to his children and put their financial needs before his own – meaning any money he had saved to go towards new dentures would spent on his kids instead of himself. “All I want is to be able to smile again, that is smile at my kids, my wife but most importantly smile at myself”. At The Chris Pine Foundation we were touched by Simon’s application and enjoyed watching him grow and come more out of his shell at each appointment. Once again, we wish to thank our sponsors and partners who supported us in 2016. Without your materials, time, expertise and assiatance we would not have been able to help Peter and Simon into their new dentures.